The State of Kuwait (Arabic: الكويت ) is a small constitutional monarchy on the coast of the Persian Gulf, enclosed by Saudi Arabia to the south and Iraq to the north. It is considered to be one of the 15 so-called "Cradle of Humanity" states. Once a small gulf shaikhdom known locally as a center for pearl–diving and boat construction, Kuwait came to international prominence in the post-World War II era largely because of its enormous oil revenues. In 60 years, successive Kuwaiti governments have invested oil revenues into building a prosperous, modern society. Although Kuwait is not a democracy, Kuwaitis enjoy more civil and political freedoms than the citizens of most non-democratic states. Kuwait's parliament is the strongest of those found in the monarchies of the gulf. Kuwaitis take pride in the rarity of political violence in their country and claim that racial conflict is rare. The name is a diminutive of an Arabic word meaning "fortress built near water." Shaped roughly like a triangle, Kuwait borders the Persian Gulf to the east, with 121 miles (195 kilometers) of coast. The third side of the triangle is the 150 miles (240 kilometers) of historically contested border to the north and west that Kuwait shares with Iraq. Although the Iraqi government, which had first asserted a claim to rule Kuwait in 1938, recognized the borders with Kuwait in 1963, it continued to press Kuwait for control over Bubiyan and Warbah islands through the 1960s and 1970s. In August 1990, Iraq invaded Kuwait and, shortly thereafter, for a short period, formally incorporated the entire country into Iraq. 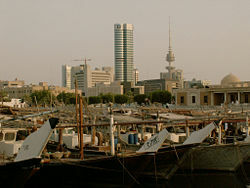 Kuwait includes within its territory nine Persian Gulf islands, two of which, Bubiyan (the largest) and Warbah, are largely uninhabited but strategically important. 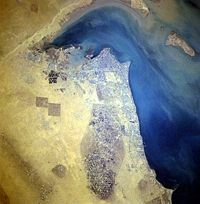 The island of Faylakah, at the mouth of Kuwait Bay, is densely inhabited. It is believed to be the outermost point of the ancient civilization of Dilmun, which was centered in what is present-day Bahrain. Faylakah is the site of an ancient Greek temple built by the forces of Alexander the Great. Bubiyan is linked to the mainland by a concrete bridge. Following Kuwait's liberation in 1991, the island was converted to a military base from which civilians are barred. Kuwait's most prominent geographic feature is Kuwait Bay, which indents the shoreline for about 25 miles (40 kilometers), providing natural protection for the port of Kuwait and accounting for nearly one half the state's shoreline. The total land area is 6880 square miles (17,818 square kilometers), which is slightly smaller than New Jersey in the United States. Kuwait consists mostly of desert and little difference in altitude. The lowest point is sea level while the highest point is an unnamed location of 1000 feet (306 meters). Kuwait enjoys a variable continental climate. Summers (April to October) are extremely hot and dry with temperatures exceeding 124°F (51°C) in Kuwait City several times during the hottest months of June, July and August. April and October are more moderate. Winters (November through February) are cool with some precipitation and average temperatures around 56°F (13°C) with extremes from -2°C to 27°C. The spring season (March) is warm and pleasant with occasional thunderstorms. The wettest months are January through March. Natural hazards include sudden cloudbursts from October to April, bringing heavy rain that can damage roads and houses, as well as sandstorms and dust storms that occur throughout the year, but are most common between March and August. Environmental concerns include limited natural fresh water, air and water pollution, and desertification. Some of world's largest and most sophisticated desalination facilities provide much of the water. 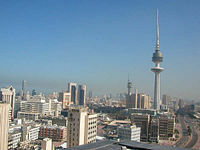 Kuwait City, the capital, had in 2005 an estimated population of 32,500 within city limits and 2.38 million in the metropolitan area. Located at the heart of the country on the shore of the Persian Gulf, and containing Kuwait's parliament (Majlis Al-Umma), most governmental offices, the headquarters of most Kuwaiti corporations and banks, it is the indisputable political, cultural and economical center of the emirate. Another city, Jahrah, is a 30-minute drive northwest of Kuwait City. The main residential and business areas are Salmiya and Hawalli. The main industrial area is Shuwaikh within the Al Asimah governorate. The main palace headquarters is located in Bayan, a wealthy suburb in the Al-Jahra governorate. Bust of Alexander the Great. During the Dilmun era (from around 3000 B.C.E. ), a civilization centered on neighboring Bahrain, the island of Failaka was already developing its own culture and religious pantheon. Worship of the sun appears to have been practiced. Shamash was the common Akkadian name of the sun-god and god of justice in Babylonia and Assyria. Human sacrifice may have taken place. Nearchus, the admiral in charge of Alexander the Great's fleet, established a colony on Falaika, in the late fourth century B.C.E., which they named Icarus, after the island of a similar shape off the Greek coast. Some elements of Greek mythology mixed with the local cults. The island was inhabited through the seventh or eighth century C.E. In the early sixteenth century, Portuguese built a fort in the area that became Kuwait City, using the fort as a base from which to venture north. Their residence in the Arabian Desert was short-lived, so until the eighteenth century, Kuwait was a territory of shifting communities. The Bani Utub originated from the region of Najd in central Arabia. The tribe possibly formed when a group of different tribal groups migrated from Najd to Kuwait on the Persian Gulf coast sometime in the late seventeenth century. From the Bani Utub descended the Al-Sabah family, which went on to rule Kuwait, and the Al Khalifa family, which went on to rule Bahrain. In 1710, the Al-Sabah family, a nomadic people of Arabian descent, settled in what became Kuwait city, which was occupied at the time by a small Bani Khalid settlement. The Bani Khalid, who were the rulers of the eastern province of Saudi Arabia, controlled Kuwait for about a century. While the desert-oriented Bani Khalid dominated the area, the Bani Utub developed maritime skills. Kuwait had arguably one of the best natural harbors in the Persian Gulf, and its location allowed it to benefit from the caravan trade to Aleppo and Baghdad, Shatt al-Arab trade, and from the smuggling trade into Ottoman territory that high tariffs encouraged. The Bani Utub traded in horses, wood, spices, coffee, dates and especially pearls; Kuwait was located within close sail of the pearl banks that stretched down the Persian Gulf coast. In the summer, boats sailed for pearls; in the winter, they turned to entrepôt trade. As trade became the basis of the economy, the Bani Utub developed new political and social arrangements. Tribal traditions were retained, but trade became tightly and hierarchically organized. Pearl divers were distinguished occupationally from rope-pullers, captains, or merchants. The proceeds from pearling were divided on the basis of occupation. A group of merchants, the core of which composed of Bani Utub, became the elite, and above the merchants were the Al-Sabah family. Soon after the colony was founded, Sabah I became leader, ruling until his death in 1762, when he was succeeded by his youngest son, Abdullah I Al-Sabah. In 1766, the al-Khalifa and, soon after, the al-Jalahima, left Kuwait en masse for Zubara in Qatar. Their emigration left the Sabahs in undisputed control, and by the end of Abdullah I Al-Sabah's long rule (1762-1812), Sabah rule was well established. Kuwait's first contact with Britain occurred in 1775 when plague, then the Persians, struck Basra and the British East India Company made arrangements to have the Persian Gulf-Aleppo Mail Service diverted through Kuwait. At this time the British, who had established a base in the region, became increasingly interested in Kuwait as the Germans had planned to extend their proposed Berlin-Baghdad railway into Kuwait, where they intended to locate a coaling station. Sabah family rule, though well established, remained limited until well into the twentieth century, because the merchants, owing to their financial power, could still check Sabah designs. The financial influence of the merchants came from their control of trade and imports, duties which sustained the Shaikh. Although Kuwait was nominally governed from Basra, the Kuwaitis had traditionally maintained a relative degree of autonomy. By the late 1870s, the Ottomans were bankrupt, and when the European banks took control of the Ottoman budget in 1881, additional income was required from Kuwait and the Arabian Peninsula. Midhat Pasha, the governor of Iraq, demanded that Kuwait submit to Ottoman rule. In May 1896, Shaikh Muhammad Al-Sabah was assassinated by his half-brother, Mubarak al-Sabah (the Great) who, in early 1897, was recognized, by the Ottoman sultan, as the provincial sub-governor) of Kuwait. In July 1897, Mubarak invited the British to deploy gunboats along the Kuwaiti coast, leading to the First Kuwaiti Crisis, in which the Ottomans demanded that the British stop interfering. In the end, the Ottoman Empire backed down. In January 1899, Mubarak signed an agreement with Britain that required British consent for any of Kuwait's international relations, and gave Britain responsibility for Kuwait's national security. In return, Britain agreed to grant an annual subsidy of 15,000 Indian rupees (£1500) to the ruling family. In 1911 Mubarak raised the taxes, prompting three wealthy businessmen to protest by diverting trade to Bahrain, hurting the Kuwaiti economy. Mubarak apologized and the three businessmen returned to Kuwait. In 1915, Mubarak the Great died and was succeeded by his son Jaber II Al-Sabah for just over one year until on his death in early 1917. His brother Sheikh Salim Al-Mubarak Al-Sabah succeeded him. In the Anglo-Ottoman Convention of 1913 defined Kuwait as an “autonomous caza” of the Ottoman Empire, and that the Shaikhs of Kuwait were provincial sub-governors of the Ottoman government. The convention ruled that Shaikh Mubarak had authority over an area extending out to a radius of 50 miles (80km) from the capital. This region was marked by a red circle and included the islands of Auhah, Bubiyan, Failaka, Kubbar, Mashian, and Warba. A green circle designated an area extending out an additional 62 miles (100km) in radius, within which the sub-governor was authorized to collect tribute and taxes from the natives. After World War I, the Ottoman Empire was defeated and the British invalidated the Anglo-Ottoman Convention, declaring Kuwait to be an "independent sheikhdom under British protection. A power vacuum sharpened conflict between Kuwait and Najd. Shaikh Salim Al-Mubarak Al-Sabah insisted that Kuwait was in full control of all territory out to a radius of 87 miles (140km) from the capital. However, the ruler of Najd, Abdul Aziz ibn Abdul Rahman ibn Saud, argued, in September 1920, that the borders of Kuwait did not extend past the walls of the capital. Ibn Saud noted that the convention had never been ratified and that Kuwait was not effectively in control of the disputed territory. In May 1920 ibn Saud's Wahhabi Bedouins of Najd had attacked a Kuwaiti detachment in southern Kuwait, forcing its retreat. In October they raided Jahra, 25 miles (40km) from the capital. In response, the British deployed gunboats, armored cars and aircraft. The Bedouins withdrew. The 1920s and 1930s saw the collapse of the pearl industry and with it Kuwait's economy. This is attributed to the appearance of cultured pearls. Kuwait became one of the world's poorest countries and became even more dependent on Britain for protection. In response to various Bedouin raids, the British High Commissioner in Baghdad, Sir Percy Cox, imposed the Uqair Protocol of 1922 that defined the boundaries between Iraq and Nejd; and between Kuwait and Nejd. On April 19, 1923, the British government confirmed that it recognized the outer green line of the Anglo-Ottoman Convention as the border between Iraq and Kuwait. This decision limited Iraq's access to the Persian Gulf to 36 miles (58km) of mostly marshy and swampy coastline. As this would make it difficult for Iraq to become a naval power, since the territory did not include any deepwater harbors, the Iraqi monarch Faisal I, whom the British installed as a puppet king, did not agree, but as his country was under British mandate, he had little say. The border was re-recognized in 1927. The protocol also established the Kuwait-Saudi Arabia Neutral Zone, an area of about 2000 square miles (5180 square kilometers) adjoining Kuwait's southern border. In 1941, on the same day as the Germany Germans invasion of Russia (22 June), the British took control of Iraq and Kuwait. The British and Russians would invade the neighboring Iran in September of that year. The discovery of oil transformed Kuwait. By 1953, the country became the largest exporter of oil in the Persian Gulf. This massive growth attracted many immigrant laborers and foreign workers. Having amassed great wealth, Kuwait was the first of the Persian Gulf Arab states to declare independence—on June 19, 1961. This declaration was challenged by Iraq which claimed that Kuwait was an integral part of Iraqi territory. Iraq threatened to invade Kuwait but was deterred by the British, who flew in troops. But in 1963, Iraq reaffirmed its acceptance of Kuwaiti sovereignty and the boundary it agreed to in 1913 and 1932. In December 1969, Kuwait and Saudi Arabia signed an agreement dividing the neutral zone (to be called the divided zone) and demarcating a new international boundary. Both countries share equally the divided zone’s petroleum, onshore and offshore. Kuwait was allied with Iraq during the Iran-Iraq War (1980-88). Kuwait paid Iraq to protect it from what it perceived as a threat posed by Iran. Yet Iraq's president Saddam Hussein claimed that Kuwait was an Iraqi province, and alleged Kuwaiti companies were slant drilling into Iraqi oil. On August 2, 1990, Kuwait was invaded and annexed by Iraq. Saddam Hussein deposed the monarchy and installed a new Kuwaiti governor, his cousin, Ali Al-Majid, also known as "Chemical Ali" for his role in gassing Kurdish civilians in Halabja in 1988. An American-led coalition of 34 nations fought the Persian Gulf War to remove Iraqi forces from Kuwait. 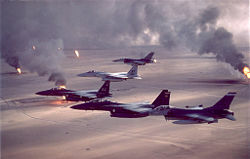 After six weeks of fierce fighting, the coalition forced Iraq to withdraw on February 26, 1991. During their retreat, the Iraqi armed forces set fire to numerous Kuwaiti oil wells or released oil from those wells into the gulf. The fires took more than nine months to extinguish fully and the cost of repairs to the oil infrastructure exceeded $5.12-billion. Certain buildings, including Kuwait International Airport, were severely damaged. Kuwait experienced an unprecedented era of prosperity under Emir Sabah al-Salim al-Sabah, who died in 1977 after ruling for 12 years, and under his successor, Emir Jaber al-Ahmad al-Jaber al-Sabah, who died in January 2006. The country was transformed into a highly developed welfare state with a free market economy. During the seven month occupation by Iraq, the Emir, the government, and many Kuwaitis took refuge in Saudi Arabia or other nations. The Emir and the government managed Kuwaiti affairs from Saudi Arabia, London, and elsewhere during the period, relying on substantial Kuwaiti investments available outside Kuwait for funding and war-related expenses. On January 24, 2006, the parliament voted to remove the ailing Emir Saad al-Abdullah al-Sabah from power. He was Emir only briefly, after the death of Emir Jaber al Ahmed al Sabah on January 15, 2006. The cabinet nominated the previous Prime Minister, Sabah al-Ahmad al-Jabir Al Sabah, to become the 15th Emir of the state. He appointed the minister of Emiri Diwan Naser Almohammad to be prime minister. 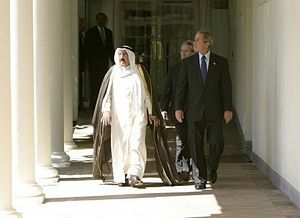 His Highness Sheikh Sabah Al-Ahmad Al-Jaber Al-Sabah with President George W. Bush. Kuwait is a constitutional hereditary emirate. The executive comprises the chief of state, who since January 2006 was Amir Sabah al-Ahmad al-Jabir al-Sabah, and Crown Prince Nawaf al-Ahmad al-Jabir al-Sabah. The prime minister is head of government. Since April 2007 Nasir Muhammad al-Ahmad al-Sabah has been prime minister. There are no elections; the emir is hereditary, and appoints the prime minister and his deputies. The prime minister appoints the Council of Ministers (cabinet) members of which are approved by the emir. Upon the death of emir, the Crown Prince succeeds. The new emir selects a crown prince, though in practice he can do this only after the members of the ruling al-Sabah family arrive at a consensus on who should be appointed. The crown prince must be approved by an absolute majority of the members of the national assembly. If the new crown prince fails to win approval from the assembly, the emir submits the names of three eligible members of the family to the assembly to select one. The emir and the crown prince must be direct descendants, in the patrilineal line, of Mubarak the Great. Successions were smooth in 1965 and in 1978, but the succession of 2006 caused a political crisis. The emir's powers, as defined by the 1962 constitution, include appointing the prime minister, dissolving parliament, promulgating laws, referring bills back to the parliament for reconsideration, and appointing military officers. Criticism of the emir and his actions are not permitted. The National Assembly of Kuwait. The legislature comprises a unicameral national assembly or Majlis al-Umma. Its 50 members are elected by popular vote to serve four-year terms. All cabinet ministers are ex officio voting members of the national assembly. Elections were last held in June 2006. There are no political parties. The formation of political parties is in practice illegal, but is not forbidden by law. Before 2005, only 15 percent of the Kuwaiti population was allowed to vote, with all women, people of less than 30 years' citizenship, and members of the armed forces excluded. Adult women were allowed to vote as of May 16, 2005. All voters must have been citizens for 20 years. The judiciary in Kuwait is an independent body. In each administrative district of Kuwait there is a summary court (also called courts of first instance); then there is a court of appeals; cassation court and lastly - a constitutional court, which interprets the constitution. Kuwait has a civil law system, with Islamic law to cover personal matters. Kuwait has not accepted compulsory International Court of Justice jurisdiction. Kuwait is divided into six governorates: Al Ahmadi, Al Farwaniyah, Al Asimah, Al Jahra, Hawalli, and Mubarak Al-Kabeer. The governorates are further divided into districts. Kuwait has been ruled by the al-Sabah dynasty since approximately 1752. Despite regular relatively free elections to the national assembly, Kuwait is not a democracy by the usual definition of the term because the prime minister is not responsible to parliament. Nonetheless, Kuwaitis enjoy more civil and political freedoms than the citizens of most non-democratic states. Kuwait's parliament is the strongest of those found in the monarchies of the gulf. Kuwaitis take some pride in the rarity of political violence in their country. All members of the ruling family receive a monthly stipend from the Amiri Diwan. Kuwait's system of government is marked by an unusually wide involvement of members of the ruling family in state posts. Members of the ruling family (who bear the title "shaikh") hold cabinet portfolios of defense, interior and foreign affairs, and are found in many other high posts in the government. This family role emerged in 1939, when shaikhs of the al-Sabah family closed the Kuwaiti parliament that the merchants had established the year before. The skyline of Kuwait City. At 1220 feet (372meters), the Liberation Tower (seen in background) is the world's 13th-tallest free-standing structure. Before the Persian Gulf War, Kuwait maintained a small military force consisting of army, navy, and air force and national guard units. A separately organized National Guard maintains internal security. Most military equipment, supplied by the United Kingdom and the United States, was either destroyed or taken by the Iraqis, and property returned by Iraq was damaged beyond repair. Since the war, Kuwait, with the help of the United States and other allies, has taken steps to enlarge and modernize the armed forces. According to Human Rights Watch, Kuwait restricts the rights of individuals of foreign descent who live permanently in Kuwait (“bidun”), to leave and return to Kuwait, to marry and found a family, and to work, and their children's rights to education, to be registered immediately after birth, and to acquire a nationality. After the Gulf War of 1990-1991, Kuwait expelled more than 400,000 Palestinian refugees (after the Palestinian Liberation Organization allied itself with Iraq during its invasion of Kuwait). The right to organize a labor union is limited. Kuwait imposes the death penalty for murder and drug trafficking. In 2005 Kuwait ranked 85th in the Reporters Without Borders world survey of the freedom of the press. According to the 2004 full report, Kuwait ranks among the freest countries in the Middle East for the press, but there is still widespread self-censorship of local and foreign press, and certain subjects are understood to be taboo. The media law, passed in 2006, became an obstacle for writers and citizens who might consider criticizing the government's performance. A court order closed a leading Kuwaiti news paper AlWatan for three days, and a magazine editor was sent to jail for criticizing government actions. Kuwait has a fairly open economy with a lot of multi-national companies operating in the oil-rich nation. Shown here is a Burger King restaurant situated at the Kuwait International Airport. Kuwait is a small, relatively open economy with proven crude oil reserves of about 96 billion barrels (15 km³), or about 10 percent of world reserves. Petroleum accounts for nearly half of gross domestic product (GDP), 90 percent of export revenues, and 75 percent of government income. Kuwait lacks water and has practically no arable land, thus preventing development of agriculture. With the exception of fish, it depends almost wholly on food imports. About 75 percent of drinking water must be distilled or imported. Higher oil prices reduced the budget deficit from $5.5-billion to $3-billion in 1999, and prices are expected to remain relatively strong throughout 2000. The government is proceeding slowly with reforms. It inaugurated Kuwait's first free-trade zone in 1999, and was to continue discussions with foreign oil companies to develop fields in the northern part of the country. During the 1970s, Kuwait benefited from the dramatic rise in oil prices, which Kuwait actively promoted through its membership in the Organization of Petroleum Exporting Countries (OPEC). The economy suffered from the triple shock of a 1982 securities market crash, the mid-1980s drop in oil prices, and the 1990 Iraqi invasion and occupation. In the closing hours of the Gulf War in February 1991, the Iraqi occupation forces set ablaze or damaged 749 of Kuwait's oil wells. All of these fires were extinguished within a year. 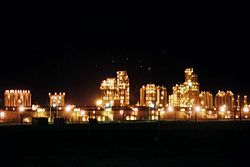 Production has been restored, and refineries have been modernized. Oil exports surpassed their pre-invasion levels in 1993 with production levels only constrained by OPEC quotas. The expenses of the Iraqi invasion and post-war reconstruction placed a heavy economic burden on the country. The Kuwaiti Government-in-exile depended upon its $100-billion in overseas investments during the Iraqi occupation in order to help pay for the reconstruction. Thus, by 1993, this balance was cut to less than half of its pre-invasion level. The wealth of Kuwait is based primarily on oil and capital reserves, and the Iraqi occupation severely damaged both. Gross Domestic Product, GDP, for 2005 was $53.31-billion, giving Kuwait a per-capita GDP of $22,800. The labor force totals 2,335,648 people, with only about two fifths of this number equaling the citizens that are of Kuwaiti Nationality. The Central Bank of Kuwait in the capital city issues Kuwait’s currency, the Kuwaiti dinar, which had in 2007 the highest valued currency unit in the world. Kuwait’s road system is well developed by regional standards. There was no railway system in 2007; however the government has announced plans to construct an underground metro to ease traffic congestion. An international airport is located in the southern outskirts of the Kuwait city metropolitan area. The country has three modern seaports, one of which specializes in oil exports. There are plans of another port to be built on the country's larger island; Bubiyan Island. Exports totaled $56.06-billion in 2006. Export commodities included oil and refined products, and fertilizers. Export partners included Japan 19.7 percent, South Korea 15.4 percent, U.S. 11.9 percent, Taiwan 11.1 percent, Singapore 9.5 percent and the Netherlands 4.7 percent. Imports totaled $19.12-billion in 2006. Import commodities included food, construction materials, vehicles and parts, and clothing. Import partners included the U.S. 14.1 percent, Germany 10.8 percent, Japan 8.4 percent, Saudi Arabia 6.2 percent, UK 5.7 percent, France 4.8 percent and China 4.5 percent. Kuwait's population was estimated at 3.1 million people, counting both locals and foreigners, in 2006. It is estimated that one in every three to four people in Kuwait are of Kuwaiti citizenship. Every Kuwait person is categorized into one of three classes, and each person’s class is recorded on his or her passport. First class Kuwaitis were those who arrived before 1900, before oil wealth and when Kuwait was poor, and make up between five and 15 percent of the population. Second class citizens arrived between 1900 and 1960. The third class includes those who arrived after 1960. About 96 percent of the population is urban. It is thought that there are at least 10,000 to 15,000 illegal immigrants in the country, increasing by 5000 individuals each year. There are also about 100,000 stateless people there, mostly Arabs. After the Gulf War the entire population of Palestinians was expelled, because they were believed to sympathize with Iraq. Most illegals are of Bengali or Pakistani decent. Life expectancy for the total population was 77.03 years in 2005. Racially speaking, Kuwaitis are described usually as “white” or “brown” (“beedh” or “sumur” respectively). About 60-65 percent are Arab (brown), 30 to 35 percent are Persian (white), and 5-10 percent are signified as "others," including Africans, East Asian, or European. The foreign population mainly consists of people from Egypt, India, Bangladesh, Pakistan, Philippines and Sri Lanka. Non-Arabs are classed as "Ajam," and most Ajam are of Persian ancestry, numbers of who have been declining. Civil identifications have no form of racial or ethnic identities. Racial conflict is claimed to be rare in Kuwait. About 75 percent of the population is Muslim (Sunni 81 percent, Shi'a 19 percent), while Christian, Hindu, Buddhist, and others make up the remaining 25 percent. Kuwait's official language is Arabic, though roughly half the country speaks the language primarily. Most foreigners speak Hindi, Urdu, Filipino or Bengali. Some Kuwaitis are bilingual. Speakers of Hindi were expected to outnumber Arabic language speakers. Women are involved parts of the labor force, but few women work outside of the home. Those women who do, often work in the social services, in clerical positions, or as teachers. Few women own or manage small businesses. Women gained the right to vote in 2005, in time for the 2006 parliamentary elections, although there was low turnout. Since 1999, women have served in the police force. Many women still go veiled and wear the traditional black, but many girls in the younger generation follow western fashion. Women are agitating to end social restrictions, for more women's rights, and for increased job opportunities. Most marriages are arranged according to tradition. Women need their father's permission to marry, and Muslim girls cannot marry a non-Muslim, although a man can. A woman can only marry one spouse, while a man may take up to four wives (polygyny). Extended families live together, both because of limited housing, and so that all family members can be involved in passing on family and cultural traditions. Both men and women have equal property rights. 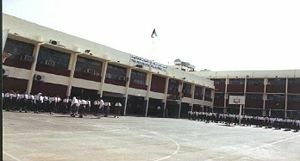 Indian School is the oldest Indian school in Kuwait. Oil revenues have allowed Kuwait to build an extensive educational system. Public schooling is free and compulsory from the age of five to 18, and several private schools also teach this age group. Pupils are segregated into boys’ and girls’ schools after kindergarten. There are numerous private schools. All private schools offer different and competitive programs. Kuwait University is Kuwait's only public university. It has a prestigious reputation in the Middle East, and has a medical school. Both the extensive library system at Kuwait University and the collection at Kuwait National Museum were heavily damaged and looted during the Iraqi occupation in the 1991 Gulf War. The Gulf University for Science and Technology, the first private university in Kuwait, was established in 2002, has two campuses in Hawalli, and was to open its third. There is also the Australian College of Kuwait, and the American University of Kuwait, both of which opened in 2004. The literacy rate for the total population was 83.5 percent in 2003. There are five classes in Kuwait society. The ruling family is at the top of the social hierarchy, followed by the old Kuwaiti merchant families. Former Bedouins, Arabian Desert nomads, who settled in Kuwait when the oil industry started, are placed in the middle, followed by Arabs from neighboring countries. Foreigners are placed at the bottom. Within classes, strong kinship bonds keep society together. Within the hierarchy are enormous gaps between the rich, the middle class, and the poor migrants. Kuwait has unique architecture. In the eighteenth century, Kuwait City was surrounded by a wall with five gates, and was protected by two forts: one in the city, and the other one at Jahra known as Red Fort. The oldest mosques in Kuwait are the Alkhamis Mosque, built between 1772–1773 and the Abd AlRazzag Mosque built in 1797. Kuwait’s traditional building materials were rubble stone covered with thick mud plaster, mud brick, and sometimes cora stone. Wood was rare, though mangrove poles imported from East Africa were used for roofs. A typical Kuwait merchant house was built in the Ottoman style, with projecting wooden balconies enclosed with wooden screens or mashrabiya and covered wooden doorways. The extreme heat of the city made wind catchers and ventilation necessary. Modern architecture in Kuwait is mostly in the international style, although there are several buildings that demonstrate a relationship with Islamic architecture. 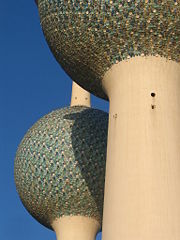 The best known example of Kuwaiti modern architecture is the water towers, consisting of tall pointed conical spires above a spherical water tank. Kuwait Towers is also considered Kuwait’s most prominent architectural achievement. 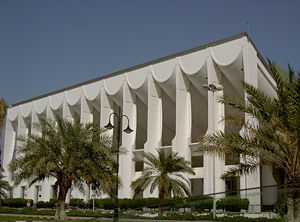 The National Assembly of Kuwait is a landmark building, designed by Danish architect Jørn Utzon and completed in 1972. Most homes are rectangular and are organized around a courtyard that allows for an enclosed yet open environment, while protecting from the arid desert wind and direct sunlight. Homes are clustered together to house an extended family—more rooms are built as the family increases in size. Homes are built so that men and women could avoid contact, and so that women were not in contact with strange men. The dewaniya is a fundamental part of Kuwaiti life. They are gatherings for men that take place in the evenings, once or twice a week, where political, social, economical, local or international matters may be discussed. They take place in an area that is separate from the main house. Usually tea is served and sometimes snacks are provided. They function as a kind of forum that provides a barometer of public opinion. Dewaniya has several types—private, public and family. The private dewaniya is for close friends who usually gather daily. Public dewaniya have a regular weekly time so that anyone can visit. Family dewaniya are for family members. Women tend to host private dewaniya at times, however they are not often as widespread and do not mix with male dewaniya. 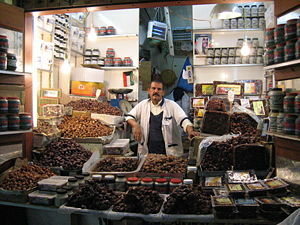 Food plays a large part in Kuwaiti culture. The traditional food of Kuwait known as mach boos consists of mutton, chicken, or fish placed over or mixed in a large mess of well-cooked and prepared rice, closely resembling the Indian biryani. Curries and sides also complement the dish, which is traditionally eaten using bare hands even though many choose to use western utensils. Food is almost always prepared and served in large amounts and it is extremely common for households to invite guests over to share meals. After centuries of living as nomads, surviving on subsistence farming and animal husbandry, increased incomes have led to increase in obesity. Believing that plump children are healthy, Kuwaitis eat a rich diet, and do not exercise as they used to. Breakfast often includes fried liver or kidneys, with cheese or yogurt. For lunch and dinner, several meat dishes may be served. In the desert, vegetables and grains were unavailable, so meat was a staple of the desert nomad's diet. Meat remains central to the Kuwaiti diet. Hospitality is displayed through serving tea and coffee. It is uncommon for a guest to enter a house, office, or even some stores without being offered tea or coffee. In Bedouin custom, a guest's refusal of tea, coffee, or such offerings is sometimes viewed as insulting. Kuwaitis greet by shaking hands and kissing cheeks. It is common for women and men to kiss cheeks if they are related. Greetings may involve a long series of questions about one's health, that of their relatives, their jobs, and so on. 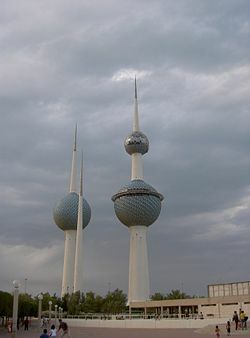 Kuwait has 10 TV channels (four controlled by the Ministry of Information); two modern English FM stations (targeting Western residents); a few Arabic radio stations; Radio Kuwait, which offers informative programming in Persian, Urdu, Tagalog and English; and five daily newspapers published in Arabic, and three published in English. The newspapers exercise self-censorship. Although no newspaper is permitted to criticize the executive authority, the criticism of other members of the ruling family is permitted. All newspapers in Kuwait were established with an "Amiri decree." Traditional Kuwaiti music was performed by women in private. 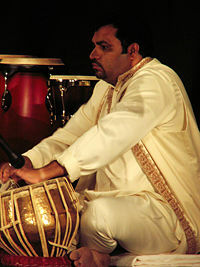 Simple percussion instruments, like the small mirwas drums, and clapping were usually the only instruments used. The Bedouin are known for an instrument called the rubabah, while the lute-like oud, tanbarah (string instrument) and habban (bagpipe) are widespread. Wedding songs include the Al-Fann, performed by percussionists and singers, all female, who also dance the Al-Khamary (individually). Al-Fareesa was a dance performed on religious holiday by women disguised as men. The dance acts out a battle between a horseman and two attackers. Other traditional dances include the men's sword dance ardah, accompanied by drums and tambourines, and the women's khamari, tanboura, fraisah, zifan and samiri dances. Kuwait's traditional music were recorded and archived, but the archives were destroyed in the Gulf War. Nevertheless, Kuwait has retained a vital music industry, both long before the war and after. Kuwait is known as the center, along with Bahrain for sawt, a bluesy style of music made popular in the 1970s by Shadi al Khaleej. Nabil Shaeil and Abdullah El Rowaished are the most popular modern sawt performers, who include influences from techno and Europop. Kuwait has a reputation for being the central musical influence of the Gulf Cooperation Council countries, with only the United Arab Emirates having a line of talents. Over the last decade of satellite TV stations, there has been a stream of Kuwaiti Pop Bands that have been successful in reaching other Arab countries with their unique style of pop. ↑ 1.0 1.1 1.2 Central Intelligence Agency, Kuwait World Factbook. Retrieved December 9, 2011. ↑ Nominal succession within the House of Sabah. ↑ 3.0 3.1 3.2 3.3 Kuwait. International Monetary Fund. Retrieved December 9, 2011. Kuwait Countries and Their Cultures. Kuwait BBC News Country Profile.